When I saw the Barry M Matte collection in my local Boots store I did a little squeal of joy. I had first seen the collection on Lily Melrose's blog and loved pretty much all the shades, but this one, Crush, stood out most to me, especially for the coming autumn/winter. 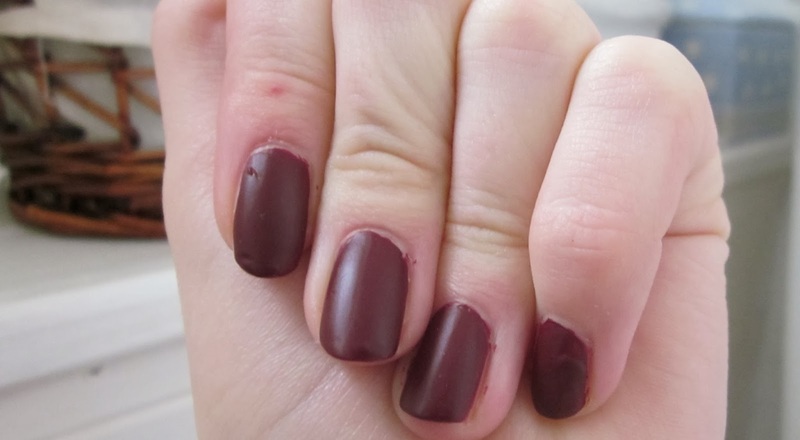 A very deep burgundy - almost black matte polish, what more could you want? I'm actually pleasantly surprised with the application of this, it is streak free and opaque with one coat! I did two coats out of habit, but I think one coat would have been totally acceptable. I also love how quickly this dries down, it dries to a matte finish although it has got a sort of sheen to it, which I actually really like. I prefer the formula of this nail polish to any of the other nail polishes I have tried, it's just so thick and quick drying. The quality of this nail polish (and all other Barry M polishes!) is insane for the price tag of £3.99. I've got my eye on some more of the shades (I'm looking at you, Vanilla!). I think Barry M have really hit the nail on the head with this polish - colour, formula and finish are all spot on! Have you tried the Barry M Matte polishes? Are you a fan? 11 comments on "Barry M Matte Nail Polish in Crush Review & Swatches"
I love this polish! Matte polishes tend to put me off as I'm so used to a glossy finish, but this shade is very lovely and autumnal- great post! I have the black polish, and I love it. Im doing a review on it soon too! This colour looks fab! I've had my eye on the Barry M matte polishes, they're all so gorgeous! I love the colour of this, can't decide whether I like the finish of it though. I bet it would be stunning with a really glossy top coat! may have to check this selection out. SO cool! perfect for fall! love the matte.